Check out these mistakes to avoid when arranging your living room. 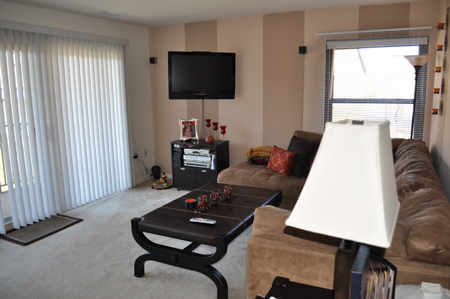 The layout of your apartment is very important, especially in your living room. Your living room is probably your most used space, and a good layout is essential for traffic flow. Check out our tips for arranging your furniture and decorations to make your living room layout comfortable and functional. Entryways should always be clear in every room, to allow easy access in and out of your apartment. Your living room entryway should be clear of couches, tables, and plants to make the room feel more welcoming and open. A good rule of thumb is to save three feet of walking space around your living room. You don’t want to be bumping into sharp table corners or hill the walls while walking around. Also, be careful about doors and drawers, and ensure they have enough room to open properly. While you want to make as much floor space as possible in a small living room, you don’t want to keep all your furniture against the walls. Pull your couch and chairs and least 12” from the wall to make the space more inviting. If you have a big living room, this will help to make the room feel cozy, rather than leave too much open space in the middle. Area rugs can add great color and decoration to your living room, but be careful where you put them. The edges and corners of rugs can be a tripping hazard, so try to keep those away from the main entryways and walkways around the room. Also, if half of your furniture is on the rug and half is on the floor, it can make the furniture wobbly and uneven. Either position the rugs so the entire piece of furniture sits on top of it, or is completely off of it. This entry was posted on Friday, June 1st, 2018	at 1:15 pm	. Both comments and pings are currently closed.